Michel Gagné has posted an article on his web site about how he created the 2D visuals for the tasting sequences in Ratatouille. It's not often that you get to see this sort of abstract animation in a feature film, and trying to visualize flavor must have been especially challenging. How amazingly cool is it to see such norman mclarenesque animation in a feature film!! 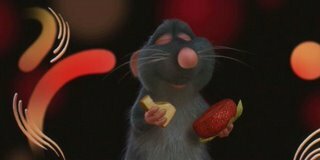 The anticipation builds as Ratatouille isnt released in cinema`s overhere. By the way, its a LOT of fun doing abstract animation to sound or music. You gotta try it to enjoy it fully. Man Im thrilled to see this! I love Gagne's work! I've been an effects animator for a decade, and his effects stuff stands leagues above the rest! You could almost taste this film. Quite intriguing, I must say. I had no idea that it was Michel who created those visualizations until my father (who is also an artist/animator) pointed his name out to me as we were watching the Ratatouille credits roll across a theater screen.... Heheh.